In 2003 I entered my first philatelic exhibit at the National Topical Stamp Show in the Display Division. It was entitled "The Story of America's Libraries" and it included ten exhibit frames devoted to all types of libraries. That exhibit has evolved considerably over the years and in 2008 I made a major revision of the exhibit which was previously titled "America's Libraries 1731-1920". I called the revised exhibit "The Evolution of the American Public Library". The new version of the exhibit allowed me to tell a fuller story of the American public library by eliminating material relating to other types of libraries. In 2009 after more changes, I exhibited at the Rocky Mountain Stamp Show in Denver. This time the exhibit was titled "America's Public Libraries and Their Forerunners". In 2009 I received the Diamond Award from the American Association of Philatelic Exhibitors after receiving 10 gold medals for the variations of my exhibit in national competition. My thoughts on receiving the award appear at the end of this web page. The exhibit underwent another major revision in 2012 and was titled "America's Public Libraries and Their Forerunners 1731-1956". That exhibit received gold medals in all four shows that it was entered in and received the highest honor of any exhibit that I have developed at the Minnesota Stamp Expo 2012 - the Reserve Grand Award. I completed another major revision of that exhibit in 2013 with more than 50% new material. It is titled "Libraries in 19th Century America". It was exhibited in four national level stamp shows in 2013. In 2014 I have a companion 10 frame exhibit to the "Libraries in 19th Century America" exhibit which I initially titled "Libraries in 20th Century America" for the Rocky Mountain Stamp Show. I have now changed the title to "Libraries and the Mail in America 1900-1960" to more accurately reflect the content of the exhibit. A reverse chronology of the development of this exhibit with the various awards it has received is given below. For exhibit titled: "Libraries and the Mail in America 1900-1960"
For exhibit titled: "Libraries in the 20th Century"
For exhibit titled: "Libraries in 20th Century America"
For exhibit titled: "Libraries in 19th Century America"
For exhibit titled: "America's Public Libraries and Their Forerunners 1731-1956"
For exhibit titled: "America's Public Libraries and Their Forerunners"
For exhibit titled: "Evolution of the American Public Library"
For exhibit titled: "America's Libraries 1731-1920"
For exhibit titled: "America's Libraries"
For exhibit titled: "The Story of America's Libraries"
There has been some controversy over the creation of the Diamond Award by the American Association of Philatelic Exhibitors. It has been likened to just another incentive for “mug hunting”. However when I was notified that I would become the 35th recipient of this award, it was personally extremely gratifying. The first glimmer of the idea of philatelic exhibiting occurred to me in 1995. Eight years later, in 2003 after the creation of the Display Division, I finally had the courage to put together my first exhibit. It was entitled “The Story of America’s Libraries” and it was entered in National Topical Stamp Show 2003 in Denver as a display exhibit. It received a vermeil award, barely. Six years later, at the Rocky Mountain Stamp Show 2009 in Denver, I received my tenth gold award which qualified me for the Diamond Award. My exhibit was now titled “America’s Public Libraries and Their Forerunners”. During that six year period, my exhibit underwent major revisions each year requiring hundreds of hours of effort on my part. Generally, the exhibit’s focus was narrowed over the six year period so that my exhibit which started out dealing with the entirety of America’s library history ended up focusing only on public libraries and their forerunners. With changes in focus, treatment, and material included, each new version of the exhibit could be and was viewed more or less favorably by the judges. I was willing to take the risk of receiving a lower medal level because revising the exhibit provided me with more personal challenge and creative opportunity. Although there were setbacks, I have achieved far more recognition for my efforts than I ever expected. The Diamond Award will represent different levels of effort and accomplishment for those who apply for it and some will not bother to apply even though qualified. To me the Diamond Award represents the culmination of years of collecting and untold hours of exhibit preparation, and I consider it a high honor to receive it from AAPE. 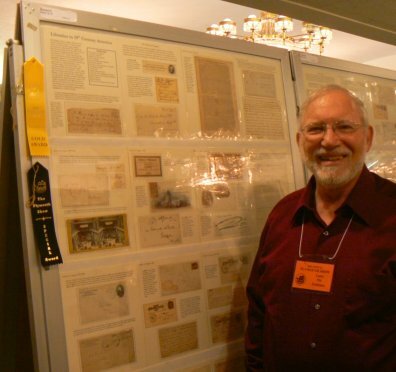 To see information about my other philatelic exhibits click HERE.